The Eastern & Oriental Express which connects the cities of Singapore and Bangkok represents the ultimate in luxurious train travel and evokes a bygone era of opulent and leisurely train travel. The compartments are characterised by rosewood furniture, ornate lamps and specially enlarged windows offering panoramic views. There are several sumptuous dining cars offering superb Asian cuisine, where smart dress is essential, as well as a piano bar, all reminiscent of the elegant heyday of rail travel. Also not to be missed is open air observation deck at the rear of the train where you can watch the single track being enveloped by the thick rainforest. After leaving Singapore the train travels through the verdant Malaysian rainforest before stopping briefly in Kuala Lumpur. Continuing further north, the traditional daily life amongst the endless paddy fields can be viewed from the train. The train stops at Butterworth to allow passengers take the short ferry ride to Penang for a brief visit to its colonial capital of George Town. Back on board, you cross the border into Thailand passing the spectacular limestone karst towers before reaching Kanchanaburi and crossing the notorious Bridge on the River Kwai, built by the Japanese in 1942 using prisoners of war, tens of thousands of whom died of heat, starvation and disease. After three days and two nights on board and travelling for 2,030km, you arrive in the bustling city of Bangkok, having enjoyed one of the most unique and luxurious travel experiences in the world. The train runs approximately 20 times a year and it's recommended to book well in advance. Bangkok is Thailand's huge and bustling capital, a chaotic and cosmopolitan city with many attractions. The most spectacular of these is the opulent and magnificent Grand Palace, reached on one of Bangkok's renowned waterways or klongs. Built in the late 18th century when Thailand was re-emerging from Burmese oppression, the complex is a vast collection of palaces, golden stupas, ornately decorative statues and wats, of which Wat Phra Kaew (Temple of the Emerald Buddha) is the most impressive. Wat Po, home of the famous 46 metre long gold-plated Reclining Buddha, is another must-see. Elsewhere in the city, Jim Thompson's House is a museum containing superb examples of Thai art and furniture, collected by the former CIA officer and silk magnate. Shops and markets such as Chatuchak Market sell a huge range of Thai goods while at night Bangkok comes alive with a huge variety of restaurants, bars and nightclubs. The Kanchanaburi Province west of Bangkok is famous for being the site of the infamous 'Death Railway' and the 'Bridge on the River Kwai'. During the Second World War, the Japanese built a railway to link Thailand with Burma to carry supplies for their expanding empire - between June 1942 and October 1943 16,000 Allied prisoners of war and an estimated 75,000 Asian forced labourers died in its construction. The Kanchanaburi War Cemetery and the JEATH War Museum commemorate those who died. You can take the train along part of the original railway and at 'Hellfire Pass' visit a memorial museum which chronicles the building of the railway. Penang Island, just off the north-western coast of Malaysia, has been dubbed the "Pearl of the Orient". Its capital George Town was an historic trading port and was ruled by the British between the 18th and 20th centuries. With one of the most diverse populations in Asia, it's a fascinating town to wander and explore its rich cultural heritage and sample the huge variety of cuisines available. Sites of interest include Fort Cornwallis (built in 1808 to defend the island) and the Chinese Clan bridge houses built on stilts. Elsewhere on Penang you can visit Wat Chayamangkalaram, a Thai architectural Buddhist Temple which houses a 32 metre reclining Buddha, the majestic Kek Lok Si Temple and the Botanical Gardens as well as numerous villages, beaches and mosques and Buddhist temples. Kuala Lumpur, or KL, is a fascinating city combining the traditional with the modern and with a vibrant and diverse ethnic mix. 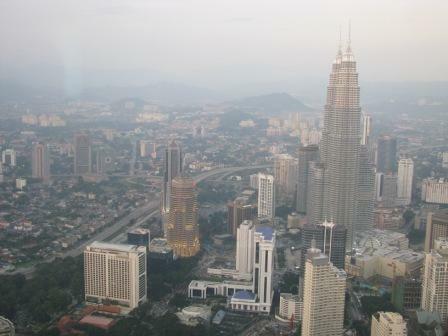 Its most prominent features include Merdeka Square, the Petronas Towers (the world�s tallest twin-towered buildings) and the 421 metre tall Menara Kuala Lumpur, which offers great views of the city. KL has strong Indian and Chinese, as well as Malay, influences and some of the best markets and restaurants in the region. Close to KL at Kampung Kuantan is one of the world's largest colonies of fireflies, producing a spectacular synchronised and rhythmic display at night. You can also visit the Batu Caves to explore the vast underground chambers of stalactites and stalagmites.